The phrase “When Pigs Fly” has been used for years to describe the impossible happening. Here in Dayton, we are working to do just that. We are the Dayton Area Rugby Club Flying Pigs. We work hard with the little we have and we have built a successful and growing rugby club based on that concept, which most would see as impossible here. We are going to continue to work even harder to make Dayton a well known area for rugby for all ages. Our mission is to grow the sport of rugby starting with youth teams all the way through our adult teams and everything in between. Dayton Area Rugby Club is making Dayton the place where pigs fly! Rugby first came to Dayton, Ohio in the fall of 1969. While many were excited about the 50th anniversary of the NFL and the impending merger with the AFL, a group of University of Dayton students, led by Bob Borgerding, played their first rugby match. This first game in Dayton would definitely not be the last and The University of Dayton continues to play rugby to this day, fielding both Men’s and Women’s squads. It would be 4 more years until club rugby came onto the scene. In 1973 the Dayton Triangles RFC, named for the first champions of the NFL, the Dayton Triangles, were founded. 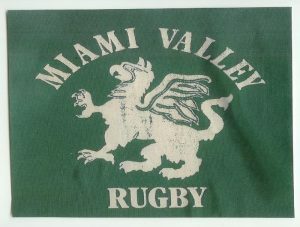 To try and clarify its identity, and perhaps distance itself from it younger American born cousin football, the club’s name soon changed to the Miami Valley Rugby Football Club (RFC). Soon after that it was again changed to Dayton RFC. While all this was going on, rugby continued to grow with the formation of Wright State University RFC. From the Wright State team, Gem City RFC spun off. Unfortunately, due to dwindling numbers, Wright State’s squad folded soon after Gem City RFC was established. Thankfully several years later Wright State was able to reestablish its club team. At the same time the Wittenberg University RFC and Wright-Patt Jets RFC developed from the Dayton RFC. In 1979 while men’s rugby was thriving in the Dayton area, women’s rugby was just starting with the formation of their first team. This team lasted into the next decade, when due to lack of numbers it folded. It would be another decade before women’s rugby returned. In the early 1980s, to the Dayton RFC and Gem City RFC merged to form the Dayton Argylls RFC. This arrangement lasted until the early 1990s, when the Dayton Argylls RFC and the Wright-Patt Jets RFC merged. This merger brought about the current club logo, which gives Dayton Area Rugby Club (DARC) its nickname of Flying Pigs, is a winged wild boar, which was chosen as a merger of the Argylls’ boar logo and the Wright Patt Jets’ jet aircraft logo. Over the years, rugby squads in the Dayton area have been very successful. In fifteens competition, the Wright Patt. Jets were Military National Champions. The Argylls, in their final season, placed third in the Midwest Division II Championship. The Flying Pigs qualified for the Midwest Division II Championships in 1994, 1995, and 2011, placing second in 1994. Dayton has had success in rugby sevens as well, qualifying for the National Championship in 1984 and 1985. In 2012 frustrated with the slow development of youth rugby, several members of DARC formed the Five Rivers Youth Rugby Foundation (FRYRF). FRYRF is dedicated to the promotion and development of youth rugby. Over the years they have grown the youth rugby program to 5 high school boys teams, 1 high school girls team and also a middle school co-ed flag rugby program. Today DARC operates 2 men’s teams in Midwest Divisions III & IV and 1 women’s team in Midwest Division II. DARC not only works tirelessly to promote the sport of rugby in Dayton, but also works to enrich the community of the Dayton Area. Our large community of current members and “Old Boys & Girls” can be seen throughout the Dayton Area volunteering for events and community improvement projects.